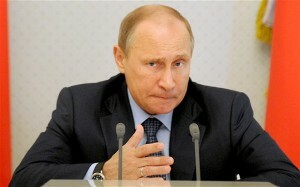 MOSCOW – Russian President Vladimir Putin has signed a decree imposing a “forbidden zone” and banning public gatherings around the city of Sochi ahead of the Winter Olympics in January and February. 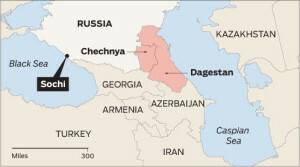 The decree establishes strict controls on who can enter and move around the Black Sea resort, with vehicle searches and specially equipped checkpoints, as part of a ring of steel the Russian authorities hope will prevent the attacks threatened by terrorists waging an independence struggle in the nearby North Caucasus republics. The decree, published in the government’s official newspaper Rossisskaya Gazeta on Friday (Aug. 23), follows calls from the country’s most wanted Islamist terrorist for his followers to hit the Games. 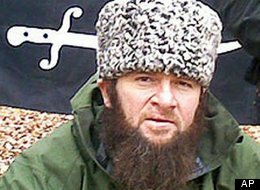 Doku Umarov, leader of Chechen terrorists. Doku Umarov, the self-proclaimed Emir of the Caucasus Emirate, released a video in July in which he cancelled a ceasefire against Russian civilians and called for “maximum force” to be used to halt the Sochi Olympics. Umarov, a veteran of both Chechen wars who has managed to elude Russian attempts to capture or kill him for over a decade, is believed to have been behind suicide bombings on the Moscow Metro in 2010 and Domodedovo airport in 2011. While Sochi itself is a relatively quiet resort town, critics have questioned the decision to hold the Olympics in an area so close to the turbulent North Caucasus republics, where suicide bombings and shootouts between rebels and Russian security forces continue on a near daily basis. The “forbidden zone” – closed to anyone for whom it is not “absolutely necessary” – creates an arc around the coastal resort from Russia’s border with the breakaway republic of Abkhazia in the South and extending up into the densely wooded mountains behind Sochi where the downhill sports, including skiing and bob-sleigh, will take place. Any demonstrations, pickets or public meetings “not connected with the Olympic games” will be banned in the city between January 7 and March 21. No vehicles without local registration except emergency services and those with special dispensation will be allowed to enter the city limits or move around within it, and sales of weapons and other restricted items will be banned for the same period. PARIS – France’s Socialist government has admitted that the country cannot cope with any further tax increases and promised no more hikes just days ahead of the country’s largest ever tax bill. In an unfortunate piece of timing, however, the pledge came just as the environment minister announced the creation of a new “carbon tax” and amid reports that the overall tax pressure on French households will rise even further next year. Returning from their summer break, the French are about to discover stinging rises in tax bills in their mailboxes – the result of a series of new levies enacted by President François Hollande as he seeks to plug the French deficit and bring down public debt – now riding at 92 per cent of GDP [Gross Domestic Product: the monetary value of all the finished goods and services produced within a country’s borders; usually calculated on an annual basis]. But the extent of the hikes has apparently even shocked the very Socialist ministers who implemented them. The total tax pressure (taxes and social security contributions) will account for 46.3 per cent of GDP this year – a historic high – compared to 45% in 2012. Some 16 million households will see an automatic 2 per cent rise in income tax as calculations are no longer mitigated by inflation. Family tax breaks will be cut. The rich will see the highest rises, following Mr Hollande’s decision to raise the rate to 45 per cent for those earning more than 150,000 euros ($200,300) – effectively 49% due to an additional levy. Amid discontent at the forthcoming rises, Jean-François Copé, head of the opposition Right-wing UMP party today pledged to enact “massive tax cuts” and to slash state spending by ten per cent should his party win power in 2017. …Around 1,000 migrants crossing the Mediterranean from North Africa (mainly Egypt and Syria) have landed in southern Italy (Calabria) in the last week alone, and their numbers show no sign of decreasing. 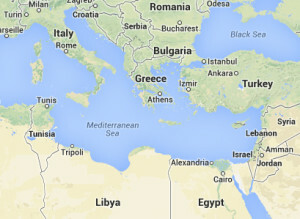 On Friday another 140 Egyptians and Syrians arrived – this time further west along the coast, in Sicily. A further 200 migrants landed on Saturday. The United Nations Refugee Agency says that the number of Egyptians arriving in Italy has doubled, from 836 in 2012, to 1,641 so far this year. Last month the UN said that some 7,800 migrants have arrived in the southern European nation this year – over double the figure for the first six months of 2012. Italian sunbathers in front of the wreckage of the boat which carried 68 migrants to Italy: 65 from Egypt, one from Syria and one from Palestine. In early August a group of asylum seekers at the Isola Capo Rizzuto centre in Crotone, on the Calabrian coast, protested against overcrowding at the holding centre – the largest in Europe. It was opened to deal with Albanian immigrants; currently it handles the Eritrean, Somali, Afghan and now Egyptian and Syrian refugees, and is well over its capacity of 1,450 people. “What we see on the Italian coast is a consequence of the exodus of the desperate, because you see two phenomena: those fleeing war and those fleeing poverty,” said Emma Bonino, Italian foreign minister, earlier this month. “The borders to the south of Libya are difficult to control. Syrians go through Lebanon and then to Egypt, arriving in a country like ours or Spain. b) Why did President Putin make this decree? c) What exactly will be banned? During what period of time? d) If you had the opportunity to attend the Winter Olympics in Sochi, would you? Why or why not? e) President Putin is known for cracking down on freedom in Russia. In this case, do you think Russians should support his decree? Explain your answer. b) What is the top tax rate in France today? How would you respond if that much of your income was taxed? Explain your answer. b) “What we see on the Italian coast is a consequence of the exodus of the desperate, because you see two phenomena: those fleeing war and those fleeing poverty,” said Emma Bonino, Italian foreign minister, earlier this month. Do you think Italy should accept any and as many refugees who come to their shores? Explain your answer. NOTE: “Answers by Email” will resume September 3rd. Sign-up below. For background information on the three countries, go to the U.S. State Department website at: state.gov/misc/list/index.htm. In July 2013 Umarov urged his fighters to “do their utmost to derail” the games, which he described as “satanic dances on the bones of our ancestors.” “We have the obligation to use all means to prevent this,” he said in a video posted on a rebel website. Socialist President Francois Hollande’s government introduced over 7 billion euros ($9 billion) of new taxes after coming to power in May 2012 and another 20 billion euros ($26.7 billion) in the 2013 budget. In next year’s budget, the government says spending cuts will account for more than two thirds of the total deficit-reduction effort. But there will still be around 6 billion euros ($8 billion) in new taxes. “The government thought that by continually raising taxes, they could raise returns but they are now realizing, rather belatedly, the error of their ways,” said Marc Touati, economist at ACDEFI consultancy. “Today in France, we are approaching 47% of total tax pressure compared to GDP. That’s the highest in the world,” he told The Daily Telegraph. Since he came to power, President Hollande has kept his electoral promise to attack French deficits and accumulated debt. He has done so, however, almost entirely by tax increases rather than by cuts in a government spending, which swallows 56.6% of the country’s GDP. Mr. Hollande pledged in May that the pace of tax hikes would slacken in 2014 and would cease almost entirely in the period 2015-2017. Steep cuts in state spending would be imposed, he said, to bring France’s annual deficit down to 3% of GDP in 2015 – meeting a target set by the European Union in Brussels. Since then, however, it has emerged that final budget plans for 2014 will include at least €6 billion ($8 billion) in tax rises. This figure does not include the impact of a programmed rise in the basic rate of VAT [Value Added Tax – a form of consumption tax] from 19.6% to 20% from January next year. Plans for reforms to the state pension and health systems, both in chronic deficit, will be finalized this week. They are likely to include a rise in a tax on household payments of up to 0.5%. From her deckchair on a beach in southern Italy, Gina Bova watched with interest as the small, rickety fishing boat was pushed by the waves closer to the shore. It was a windy Saturday afternoon in August, and the beach was packed with holidaying families. But suddenly, as the boat hit the shallow sandbank, the passengers sprung overboard and made a dash to the shore, with police in hot pursuit. Her feeling of inevitability is one shared by the Italian authorities – and their counterparts across Europe. The boat which Mrs. Bova and her family saw arriving near Monasterace was the fifth in a fortnight, and contained 68 illegal immigrants – all but three Egyptians – who had sailed to Italy to escape the turmoil in their homeland. Skirting Greece, the boats from Egypt can sail in a straight line north west from Alexandria, arriving on the coast of Calabria in five to ten days. Syrians – and now Egyptians – mainly stay. The Syrians are notably better dressed and more wealthy than the other migrants, and some refuse offers of help – preferring to get in a taxi and drive away. One man even arrived with an iPad, saying he used to come to Italy on holiday but lack of papers forced him to return as a “clandestini”. Pregnant women or those who have given birth less than six months previously are also entitled to remain in Italy, leading many expectant mothers to attempt the crossing. Of the 68 passengers, 25 were children – who will automatically be granted the right to stay. The rest, said Barbara Molinario, southern Europe director for the UNHCR, had chosen not to apply for asylum – many do not want to cut ties with their homeland – and so would be returned to Egypt almost immediately. Below is an example of our free “Answers” email service, which resumes next week. b) President Putin made this decree following calls by Russia’s most wanted Islamist terrorist for his followers to hit the Games. c) Any demonstrations, pickets or public meetings “not connected with the Olympic games” will be banned in the city between January 7 and March 21. No vehicles without local registration except emergency services and those with special dispensation will be allowed to enter the city limits or move around within it, and sales of weapons and other restricted items will be banned for the same period. d) Opinion question. Answers vary. e) Opinion question. Answers vary. b) The top income tax rate in France today is 100%. Opinion question. Answers vary.